← Is it really chicken? Sorry about the lateness of this post, Mikey was having technical difficulties getting his latest review online, so I decided to step in with some thoughts regarding tonight’s Top Chef finale. For those of you who have watched the show, you probably recognize the phrase that I used in this post’s title. It was uttered by Fabio Viviani a few episodes back, referring to Jamie’s penchant for using scallops in every dish. And you probably saw that for the first time ever, a former contestant (the aforementioned Fabio) was allowed to weigh in at the final meal. Anyway, I’m pretty sure that Bravo is in development with Fabio on a new series (or at least they should be). I’m setting the over/under on the first season of Top Scallop [Honorable mention: Top Bunky Bed] at 6 months. Get your Tivo ready now. Regarding the finale, I was actually a little disappointed with the result. I was routing for the sentimental favorite, Carla, but I also had Stefan as #1 in my rankings all season. 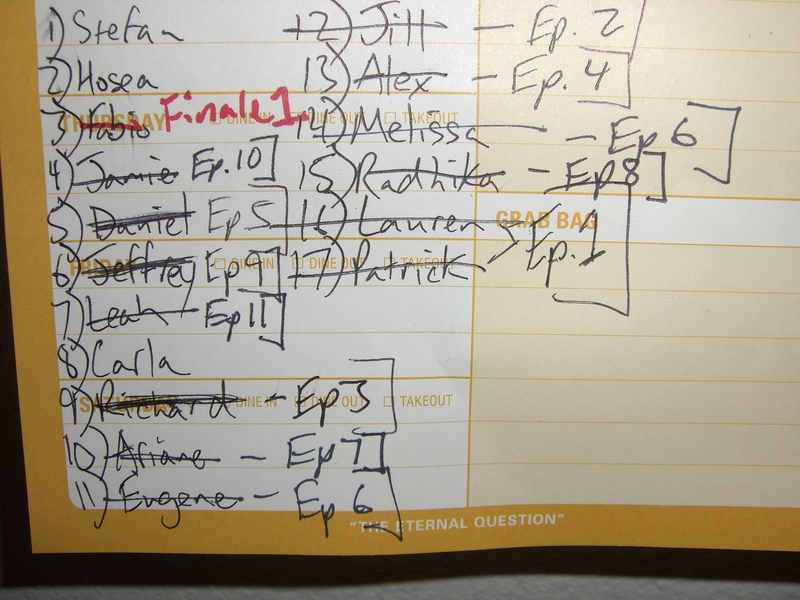 (See below) Yes, I am “that guy” when it comes to picking my favorites on the first episode. But in my defense, I was pretty damn close to right. How the eff did Radhika stay in the game so long? So Hosea, my #2 pick, is the Top Chef, and while this makes my pics look pretty good, I’m actually kinda pissed that he won. I thought that Stefan was the better chef and I thought that he took more risk in doing a dessert which completed the meal. He cooked the best dish of the evening and he actually showed himself to be a decent human being when he comforted a crying Carla after judges table. Speaking of Carla, I think that she may have messed things up for Fabio in the fan favorite department. She even had me tearing up a little bit at the end there. Still, I would really hate to see Fabio lose out on the ten grand, but I think that since this is Bravo TV we’re talking about here, the gay vote will be enough to carry him to victory. Whatever happens, it’s either going to be Fabio or Carla winning Fan Favorite. Put a benjamin on it. Click here to vote for Top Chef Fan Favorite! The last thing I would like to touch on before hitting the sack is this: Bravo needs to fire their photoshop guy. Hosea just won Top Chef and they made the poor guy look like a cancer patient. It’s not as if this was a live broadcast. They knew he was the winner weeks ago, and yet they did this crappy of a job on his picture? Now that you’re the Top Chef Hosea, you’ve got to start looking after your image. If you need a good advisor, feel free to call me anytime.